156 points will be rewarded to you when you buy this item. Save 10% off retail price with this package! 1 Omni shell: Amazing SoftBums 2-in-1 Pocket Diaper. Snap in Pod or stuff Pod into easy to use Pocket! 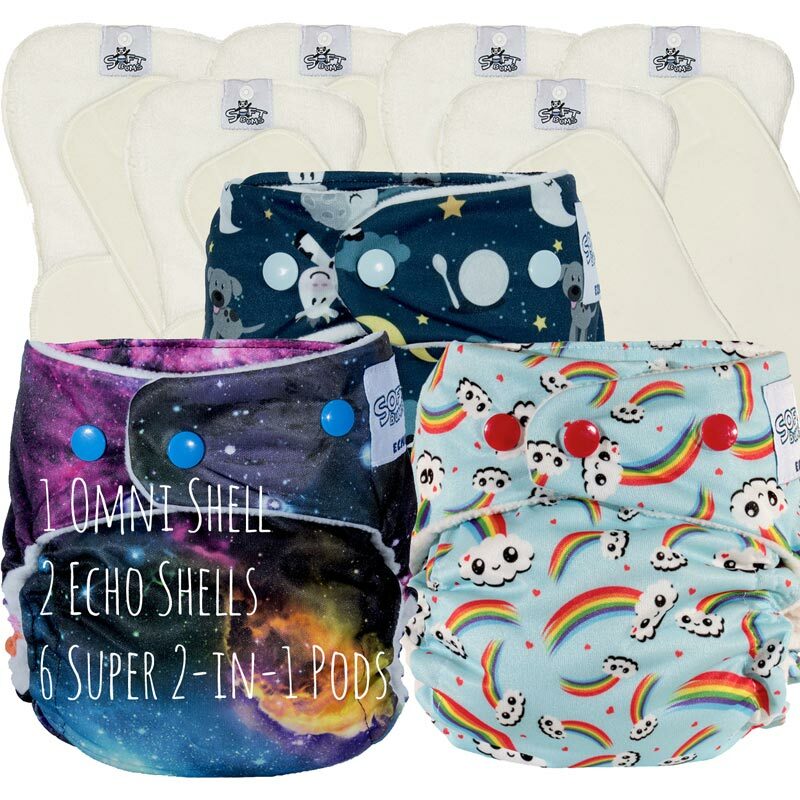 2 Echo Shells: The SoftBums Echo is our original diaper shell, made to use with our Snap in Pods. 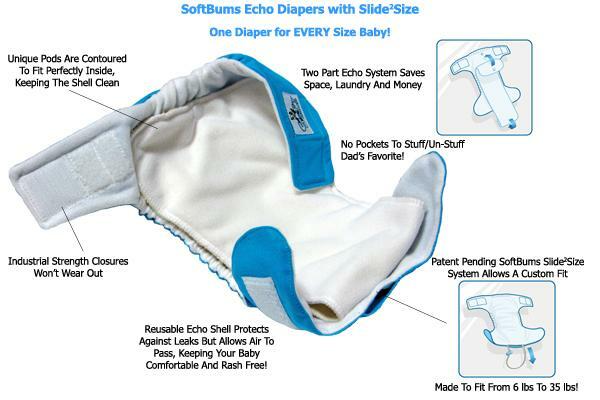 With our signature trim fit, no other diaper fits like a SoftBums Echo! 6 pack of SUPER 2-in-1 Pods: Pods are the absorbent insert that snaps or stuffs into your SoftBums shell. Fits all leg widths from 4" - 14" for NO red marks EVER. Made in the USA! SoftBums One-Size DryTouch SUPER Pods are our newest DryTouch Pods, they are redesigned to be easier to use, versatile, and fit perfectly in your SoftBums Shells!! This Pod is made up of 2 separate parts. The OS contoured Pod has rise snaps to instantly size to Sm, Med, or Lg. Attached is our useful and popular Small DryTouch Pod that snaps onto the One-Size pod for extra absorbency at night or for heavy wetters. Each Pod can be used alone for babies 3 mo and under giving you 2 diaper changes for the price of one!!!! 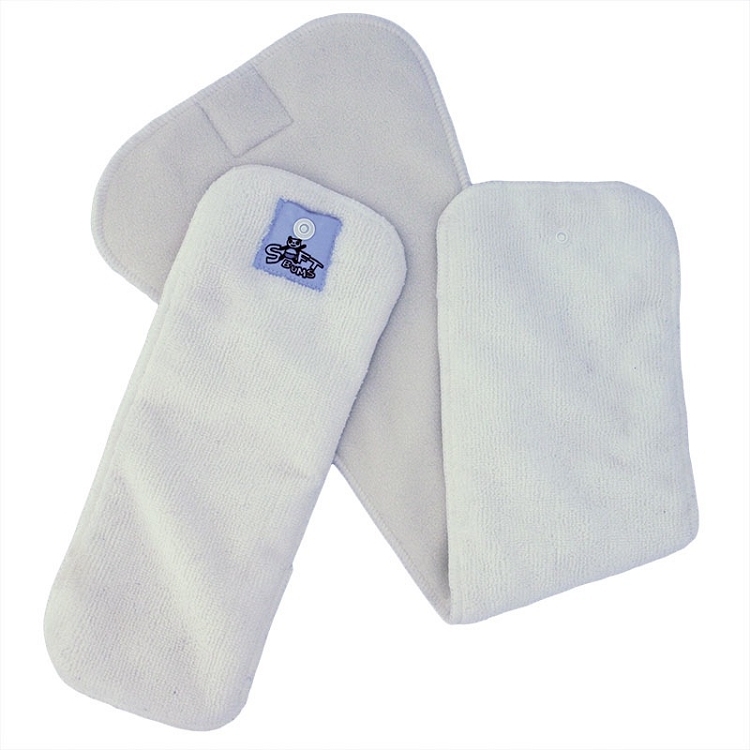 Our signature creamy soft fleece tops all of our DryTouch Pods. DryTouch means your baby feels dry, solids roll right off, and stains don't stick around. Both Pods can be changed out to reuse your Shells. They are Super Absorbent, Super Trim and dry Super Fast. 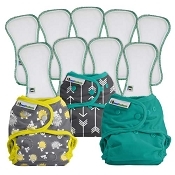 Both Sm and OS Pods are made to attach to your SoftBums shells with a snap, making a perfect diapering system. Both Pods are trim and fit in your SoftBums Shells with no folding or tucking. Just snap and GO!! 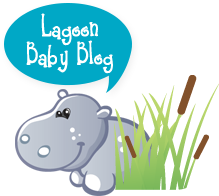 This is the best diapering system on the market, designed just for you and your baby! Q: I am wondering if this starter kit is also available with snaps instead of velcro? A: Yes, please note in Comments during Checkout you would like Snaps instead of Velcro and we will include Snap Shells. Was this answer helpful? 8 of 8 Customer(s) found this Answer helpful. Q: What colors are included with the boy/gender neutral package? A: Feel free to put colour requests in comments during checkout and we will do our best to accommodate. 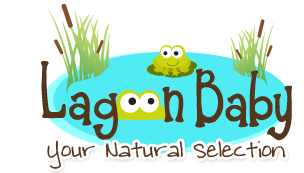 If no specification, we select from the following colours for the Boy/Gender Neutral Kit: Snowcone, Coconut, Ocean, Sprout or Chocolate.